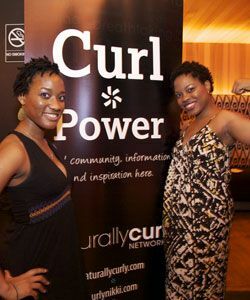 On Saturday, July 23, almost 300 curlies from all over the East Coast (and some from as far as Atlanta), came out in full force for theNaturallyCurly & Natural Selection Curly Pool Party. As temperatures rose above 100 degrees in New York City, the Curly Pool Party, hosted at the Grace Hotel offered not only respite from the oppressive heat, but a first-of-its-kind, hands-on experience for textured haired attendees to gather poolside and learn about summer hair and skin care. 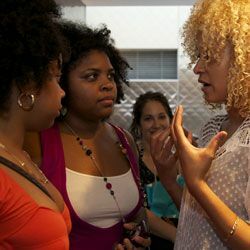 "That was by far the best #naturalhair event I've ever been to," exclaimed one attendee on Twitter after the party. Leading up to the event, there was one thing on everyone's mind: sure there's a pool, but will they swim? Did they ever! As soon as the doors opened, attendees were in their suits, hopping in the pool and splashing around with big smiles on their faces! Stylists from Ouidad, Jane Carter, and Hair Rules were on hand with conditioners, creams, gels and diffusers to style attendees' hair after getting out of the pool and to offer up some swimming-specific styling tips. Shea Moisture offered a unique spa bar with deep treatments, body scrubs and massage oils alongside the steam room, sauna, and shower space. The result: a unique opportunity for hands-on interaction with new hair and skin products in a fun environment! While attendees arrived looking dressed to impress, by the end of the party, it was clear that wet curls paired with a swimsuit were the most fashionable outfits of the evening. Attendees singing in the shower to the killer mixing of DJ Christian Jae. Getting up close and personal with sponsors who attended the event: Jane Carter, Dickey from Hair Rules, Sondriel from Ouidad, and Rich Dennis of Shea Moisture. Announcing the new Global Editor of NaturallyCurly.com: Cassidy Blackwell of Natural Selection. Seeing all of the beautiful heads of curls floating around the pool! We would like to send a huge thanks to all of our sponsors and to all of the attendees for coming out and swimming with us! In the end, there are two things for sure: swimming and curls are a natural combination, and you can be sure we'll be doing more events! For a full gallery of pictures, visit theNaturallyCurly Facebook Page. Photos courtesy of Weatherbee Photography.